In a time of controversy over the relevance and utility of industrial action, this book outlines the case for protection of a right to strike. It argues that such a right can be viewed as civil, political and socio-economic in nature, depending upon one's conception of 'good governance' and 'democratic participation' at the national level. This has consequences for what is perceived to be the appropriate scope of the right and the extent of any legitimate exceptions. Critics of domestic labour legislation tend to appeal to international and European standards, chiefly those promulgated by the International Labour Organisation (ILO), the Council of Europe and the European Union (EU). 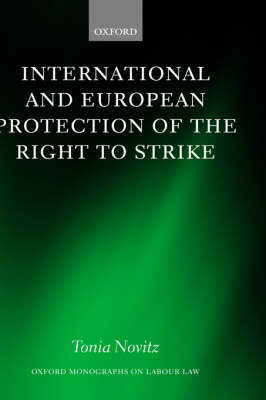 All these organisations acknowledge the importance of a right to strike, but they differ in the manner in which the right is defined and protected. This book suggests that this is because each organisation adopts a distinctive view of the appropriate justificatory basis of this entitlement. This work also addresses current enthusiasm for reforming the governance of international and European organisations which would bolster their legitimacy. It is suggested that, despite the entrenched structures and cultural norms of each institution, such a process of reform could lead to greater consistency of standards relating to the right to strike. A crucial question for workers, in the light of these developments, is whether there will be a 'levelling up' of rights or diminishing protection for those who organise or participate in industrial action. This book ends by considering the current responses of the ILO, the Council of Europe and the EU to these forces for change.